Get ready for the exciting conclusion to my first foray to Mexico. After whale sharks, seasickness and tequila everywhere you turned, what more could happen? Read the blog to find out! Remember that good dose of sun I got in my last blog? Yeah, here’s what happened. The next morning, pain set in as soon as I opened my eyes. Horror set in when I saw the lobster red color covering the majority of my body. Reality set in as I realized my worst fears had come true and I’d brought them on myself. Let me name the sunburned body parts: arms, chest, legs, stomach, parts of my back, face (less so than the rest of me) and tops of feet. Pretty much everything. And dear Lord, that was the worst sunburnI’ve ever had. By far. Bar none. There was this one time in Florida where I’d fallen asleep on the beach without sunscreen, but even that was a cake walk compared to this burn. The view of the lagoon at our final dinner in Cancun. 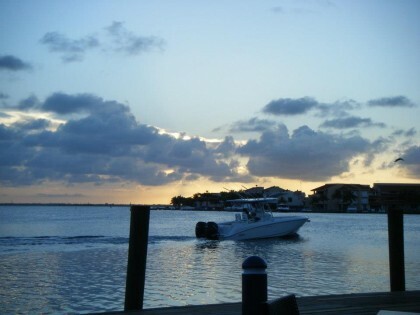 How picturesque, right? Although when comparing my state of health to others in our party, I was doing relatively well. Sean was as sunburned as I, although he’d spent more time exposed the day before and had actually given himself mild sun poisoning (I didn’t even know that was a thing), our friends Adam and his wife Soo were similarly charred (even though both are naturally darker to begin with), and surprisingly Brian and his girlfriend Malia (the two who were the most seasick) were the two doing well and were relatively untouched by the sun. This probably goes without saying, but we spent the day undercover, sleeping and reading in the shade, taking it as easy as possible and making no sudden moves. By dinner time that evening, I’d recovered enough to gingerly pull on more than a robe and meet up for a final dinner with our local pals before heading back to the States the following morning (well, everyone except Adam and Soo). We knocked on their door more than once with no response – must have still been worn out from the day before. 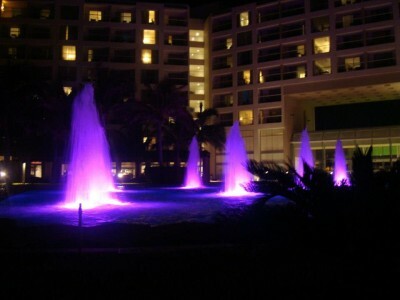 A picture of the hotel fountains at night. So pretty and the colors changed over time. To make it easy for them to join us later, we shuffled across the street for a relaxed final dinner at Taco Grill in the La Isla mall. Lucia and her husband Jeremy joined John, myself and Sean and Brian and Malia. It was a good time, and once we’d finally said our good-byes we had a final, perfect walk along the beach in the dark before bed. Sunrise came all too soon the next morning and Sean and I grabbed our bags, checked out and hopped in a van back to the airport. Adam and Soo (lucky as they were) decided to stay a few extra days, but for those of us whose jobs didn’t involve traveling to exotic locales “for work,” we had a plane to catch. At 11AM, our plane lifted off from the runway in Cancun, thus ending our first, fantastic tropical vacation. What an introduction to Mexico though! I couldn’t wait to go back and see more – minus the third degree sunburns of course. I can’t think of a better way to spend the afternoon. This entry was posted in Mexico, North America and tagged Cancun, Mexico, North America, Sunburn, Travels on June 2, 2014 by Paige N..